What the “public” can do! “One of the greatest spiritual maladies of our time is boredom, the opposite of newness, a boredom bred of the monotomy of routine in a bureaucratic, technological society. And as we retreat further and further into private life our boredom deepens. The private is the realm of the familiar, and though the familiar brings us comfort, too much comfort can anesthetize our spirits. The public, however, is the realm of the novel and the strange, and one of the greatest rewards of being in public is the banishment of boredom from our lives…though boredom may seem to be a strictly personal, private problem, it is finally a public concern. Boredom breeds violence as people strike out to find something that will quicken the pulse., something to make them feel alive again. Violence against the stranger – so common is our day – come partly from our fear of all things strange. But it comes, too, fromm our deep need to escape the passivity of a consumption-oriented, spectator society; it comes from our need to escape the self-defined private realm, to push against some “otherness” and get a response. A healthy public life allows us to escape boredom without recourse to violence, a chance to be real persons in a world of other persons, acting and reacting, initiating and responding. 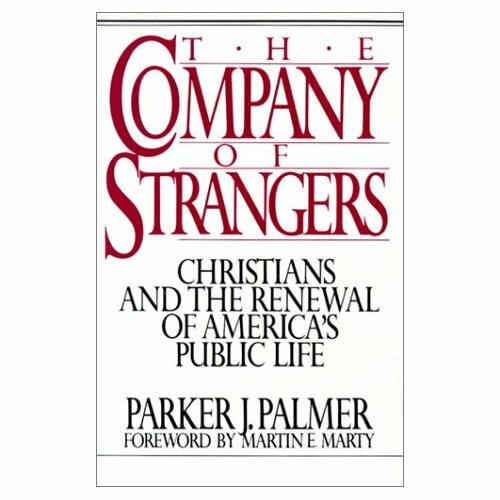 But only as we enter and participate in the public life will the stranger be able to deliver this gift, the gift of new life which God has promised.” Parker Palmer, The Company of Strangers. I’ve been having some discussions online with the students in my three classes on Romans/Galatians. I placed a provocative article on the topic “A personal relationship with Jesus?” at the bottom of one of the lectures giving them an opportunity to reflect on some different persectives. One of the reasons I love the Palmer quote above is that it in some way explains why so many so-called Christians like taking shots at people outside of the faith. First of all, there has been a distinct divorce of a “public life” for so many who are following Jesus. More and more people, capitalizing on that extremely individualistic phrase (“my personal relationship with Jesus”), hide out from a deliberate engagement with public life in order to opt for a privatistic piety. As many of us know from experience, the more caught up in ourselves we become, the easier it is to start taking shots at that which threatens our private world as well as those issues/people that we don’t bother to understand. So many local churches that I know are caught up in tensions, anger, and brutal infighting…could it be that boredom has set in throughout the lives of many local fellowships? Could it be that once privatism has taken root and a depreciation for a life that is outside of the “personal” realm, that all we have to do it open fire on those we don’t like, don’t appreciate, and don’t see as vital to our existence…the holy stranger/other? In addition, may this explain a bit of the demonization of the culture that plagues so much of contemporary Christendom? Mmmm…some thoughts for you. As I am apt to say, “put that in your pipe and smoke it”. Better yet, pick up on Palmer’s book and give it a few select tokes…in other words, “inhale it, brother or sister”! may i borrow that book when I get there? yep you can! Of course!